I’ve written a lot about French wines in the first 3 months of the blog and also had a go at trying to decode Italian wine lists (Navigating Italy). In my looking forward to 2013 post I talked about discovering more about the delights of Australian wine so here is an overview of some of the key Aussie wine regions and the grape varieties to look out for, along with some recommendations. I’ve tried to concentrate on wines that are easily available to everyone. The great thing about Australian wine is the simple labeling. 99% of the time the label will tell you the name of the producer, the region it is from, and the grape varieties used to make the wine. This is one of the key reasons for the success of Aussie wines, but so too is the quality at the mid to high end of the market. Also, some of the names of the wines are superb! The regional identifier of South East Australia (or SE Australia) is a catch-all which covers most of the major wine producing states (except Western Aus). Quite often the grapes used to produce these wines have been deemed not good enough to go into the regionally labeled wines. They will have been bought by a high volume wine maker to produce cheap and cheerful wines, so could be a blend of grapes from 3 or 4 different states. It’s not to say these are poor wines, it’s just they won’t have the complexity or sense of place (terroir) that you will find from location-specific wines. These are the wines you find in the cheap supermarket promotions. Although WA accounts for a small proportion of Aussie wine (under 5%), the quality is excellent. The vast majority of wines from the region are in the premium category. The Margaret River region is the most famous in the area. The key grapes grown in the area are Cabernet Sauvignon, Shiraz and Chardonnay. My pick of the producers is Leeuwin Estate, who’s “Art Series” Chardonnay is regarded as one of the best white wines in the country. Other regions to look out for are Great Southern and Swan Valley. Could be called the wine state of Australia. When we come to looking at the names of the sub-regions I’m sure you will recognise many of the famous names from bottles you have drunk. When you see the names Barossa Valley or McLaren Vale, the grape that immediately screams out at you is Shiraz. Look out for Barossa wines from Peter Lehmann, king of the valley. These areas have very hot and dry summers and produce blockbuster red wines, which are rich, chocolaty and spicy. Yum! For Cabarnet Sauvignon, look no further than Coonawarra. The wines have lovely blackcurrant and eucalyptus characteristics and are a brilliant accompaniment to rare red meat. And don’t forget the white wines. Some of my favourites come from the Clare and Eden Valleys, especially the precise citrus-led bone-dry Rieslings, which can be stunning. And for something completely different, head towards Rutherglen and their luscious dessert wines made using Muscat – a very wine that works as well with fruit-based desserts as it does with chocolate. Home of the Hunter Valley, the most northerly and tropical of Australia’s wine producing regions. The Shiraz is from the region is often described as softer and spicier than those from further south, and are generally thought to age very well. For white wine, the region is famous for Semillon, although many of the other regions are beginning to produce more and more of these grassy, citrusy wines. A region I keep reading about (well I definitely notice it!) is the superbly named Tumbarumba – I’m on the look out for some Chardonnay from he as the write-ups get better and better. The cool climate of Tasmania provides new opportunities for Aussie wines and the primary grape growing in the state is Pinot Noir. The island is producing nuanced and delicate wines from this notoriously difficult grape and I look forward to discovering more. White wine development is also very exciting, with precise and fruit driven Rieslings, as well as a growing reputation for Pinot Gris, in the style of the Mosel – very exciting. The very best Australian wines are up there with the very best in the world. If you really want to push the boat out and try something really special, here’s a premium list to choose from. I’ve only been to Aldi on a couple of occasions and on both times it was to take photos of in store displays for work. My parents and in-laws are always extolling the virtues of the discount supermarket and Which voted Aldi the best supermarket in the UK for 2012. Mum served up an Aldi roast duck over Xmas which was absolutely delicious so The Fish and I decided it was time for a visit. We picked up a duck and the much advertised 4-bird roast for the freezer as well as plenty of cleaning products and lots of other stuff we hadn’t realised we needed. Then at the end of the shop we came to the wine section. 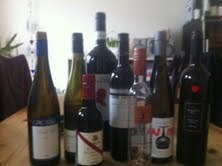 I have read good things about the Aldi wine range but never really considered buying as we never go there. So why not give it a go I thought. The most expensive bottle is £12.99 for Champagne, the most expensive still wine was £6.99. 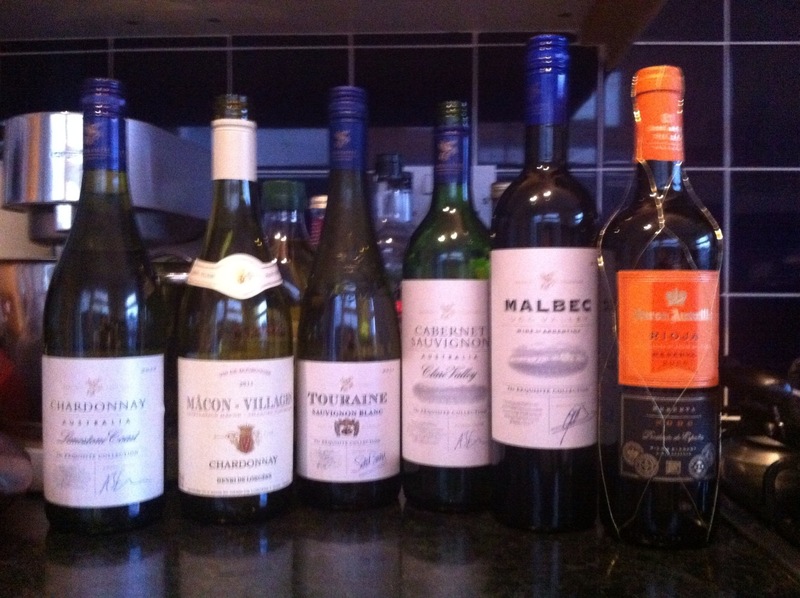 I selected 6 bottles, 3 white and 3 red for a grand total of £34.94… Less than I often pay for a bottle! Enter your email address to get new posts direct to your inbox as well as the weekly Wine Geek newsletter - then check your inbox to confirm! The Finish… or just the Start? I’m still here… tasting white wines! Catalonian wine in 1,500 words! Weddings, friends and… Californian Sangiovese? ?